The third quarter is now in the books and here's what we've learned about U.S. equities over the last three months: Riskier stocks are still hot, defensive names are not, and the so-called reflation trade is alive and well. Oh, and September isn't always the cruelest month for equities. Leading the pack were the usual suspects. 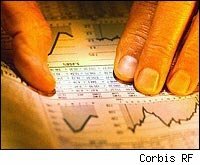 The financials, industrials and materials sectors had blowout quarters. Consumer discretionary names did well, too. But how much steam is left in these sectors remains to be seen. "The sectors that were hit the hardest were the ones to come fastest out of the trough," says Karl Mills, president and chief investment officer for Jurika Mills & Keifer, an investment advisor in Oakland, Calif. that manages the Counterpoint Funds. "But now we are going to be in a recalibration phase, where there will be a shift to higher-quality stocks from lower quality and to larger-cap names with legitimate growth prospects." Of the 10 major sectors in the S&P, financials produced a total return of more than 25 percent in the third quarter. That's not too shabby at all. In ordinary times, investors would be happy with that kind of performance over three years -- not just three months. The industrials and materials sectors, meanwhile, returned about 22 percent each. Huzzah. So what do banks, cement makers and mining companies have in common? The reflation trade, for one thing, where low interest rates, a cheap dollar (which is getting cheaper by the day) and global stimulus spending amounts to a sea of liquidity that "reflates" asset prices -- whether the fundamentals entirely support it or not, says Michael Church, president of Addison Capital Group, an investment management firm in Yardley, Pennsylvania. "Some of the performance is warranted," Church says. "But there is also a tremendous amount of liquidity out there and these sectors are coming off a very low base." It's a general market truism that the harder the fall, the bigger the bounce, and that certainly helps explain what's going on with these top sectors. And then there's the case that these classes are coming up against such lousy numbers from a year ago, especially the financials. The S&P 500 as a whole is forecast to post a 25 percent drop in third-quarter earnings, according to Thomson Reuters, but financial sector profits are expected to soar by more than 60 percent. Ah, the prospect of easy comparisons and low expectations...how the market loves to bank on thee. That's not to say investors should go chasing returns in the sector. As Church points out, the fat money has already been made and financials as a whole are still highly exposed to commercial real estate, housing and the state of the consumer. "It's not easy to get too excited about a business model that is leveraged to those three things," he says. If anything, it's the second- and third-place finishers of industrials and materials that have better fundamental prospects. Industrials have slashed inventories to historic levels, spring-loading their margins for future bottom-line growth. Materials, for their part, will benefit from the global economy recovering more quickly than the U.S. (Thanks, China!) Both sectors are also getting a nice tailwind from the falling dollar, which helps boost exports. But what do we make of the middle of the pack? Consumer discretionary stocks returned nearly 20 percent in the third quarter, which is pretty amazing considering unemployment is at 9.7 percent. They were priced for Armageddon not too long ago, Mills says, so some of this is just a natural snap back. But until we get more clarity on the all-important holiday shopping season, these guys look to be in the "gone too far too fast" pile. The same might be said for information technology, which actually cooled off in the third quarter, generating a total return of more than 16 percent. Consider that for the year to date tech is leading all sectors with a 45 percent return, and you can see how the fat money has probably been made there, too. Tech, after all, is an early cycle sector, meaning it moves well in anticipation of recovery and it's possible that all reasonable economic expectations have already been baked in. Then again, a couple more noisy deals -- like Dell's (DELL) acquisition of Perot Systems (PER) and Xerox's purchase of Affiliated Computer Services (ACS) -- could get things jumping some more. So where do we go from here? Who knows? But financials have been leading the market by the nose throughout the crisis -- on the way down as well as on the way back up. Let's just hope and pray nothing happens to disturb the sector, at least until the market can find new, less manic, leadership. As regrettable as it may seem right now, for the foreseeable future, it still looks like as go the financials, so goes the market.